Shop online for over 200 railstuff model trains at discounts up to 26%. Freight Cars is the most popular of the 5 railstuff model trains categories, then Buildings, and Railroad Scenery. This is the Banded Lumber Stack Red Ends (2) Model Train Freight Car in HO Scale by Model Railstuff. This is the Banded Lumber Stack Green Ends (2) Model Train Freight Car in HO Scale by Model Railstuff. This is the Cut Stone Loads w/Drill Marks Unpainted (Fits Most Flat Cars or Gondolas) Model Train Freight Car in HO Scale by Model Railstuff. 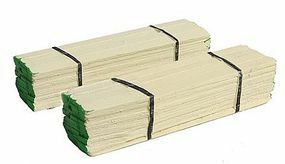 This is the Lumber Loads Stacked For Open Door Box Cars Painted Model Train Freight Car in HO Scale by Model Railstuff. 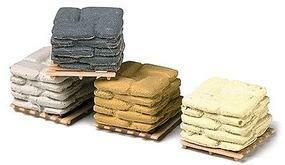 This is the Banded Sacks on Pallets (4) Assorted Colors Model Railroad Building Accessory in HO Scale by Model Railstuff. 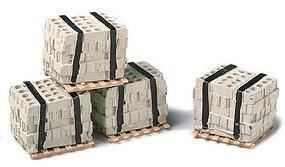 This is the Banded Concrete Blocks on Pallets (4) Model Railroad Building Accessory in HO Scale by Model Railstuff. 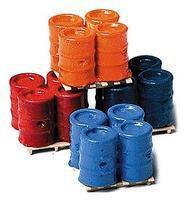 This is the Banded 55 Gallon Drums on Pallets (4) Assorted Colors Model Railroad Building Accessory in HO Scale by Model Railstuff. This is the Square Hay Bales (5) Model Railroad Building Accessory in HO Scale by Model Railstuff. 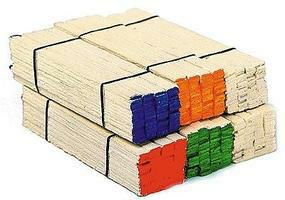 This is the Banded Bricks on Pallets Red (4) Model Railroad Building Accessory in HO Scale by Model Railstuff. This is the Pulpwood Loads For Micro Trains Bulkhead Flat Car 8' Logs Model Train Freight Car in N Scale by Model Railstuff. This is the Coal Load For Athearn 34' 2 Bay Hopper Model Train Freight Loads in HO Scale by Model Railstuff. This is the Banded Lumber Stack Blue Ends (2) Model Train Freight Car in HO Scale by Model Railstuff. This is the Dolphin/Piling Cluster Model Railroad Building Accessory in HO Scale by Model Railstuff. This is the Stone Bridge Abutment Set Gray Model Train Bridge Wall in HO Scale by Model Railstuff. This is the Mr. Plaster Unpainted Kits Wooden Crates Three Different Assorted Sizes Model Train Building Accessory in HO Scale by Model Railstuff. This is the Banded Bricks on Pallets Yellow (4) Model Railroad Building Accessory in HO Scale by Model Railstuff. This is the Stone Center Bridge Pier Single Track Gray Model Railroad Bridge in HO Scale by Model Railstuff. This is the Retaining Walls Run Down Gray Brick Model Railroad Scenery in HO Scale by Model Railstuff. This is the Banded Cinder Block on Pallets (4) Model Railroad Building Accessory in HO Scale by Model Railstuff.